My favorite snack during a road trip has always been slices of grapefruit. It doesn’t make any sense; peeling a grapefruit and eating slice by slice has got to be one the messiest activities. I first experienced this satisfying snack on a road trip through Newfoundland, and years later while driving from Mount Rushmore to Montana. Obviously it’s a snack better enjoyed with a friend in the passenger seat, someone to do the dirty de-peeling work for you and then give you one slice at a time (and some paper towels on your lap is key). However, I think I recently found a new favorite snack, a solution to having something delicious and healthy but not too juicy or messy: the Roasted Chickpeas from 2Armadillos, a brand new product sweeping DC by storm and one now featured on our Pleasant Pop Farmhouse Market’s shelves. The first batch of 2Armadillo chickpeas was roasted in 2011 as a simple snack to aid mid-afternoon hunger. After resorting to chips and candy for years, Greg, one of 2Armadillos co-founders, spent over a year oven roasting chickpeas in his NYC apartment, adding whatever herbs and spices he had lying around. As he continued perfecting his recipes, Jimmy (the other co-founder) took a strong interest in the home-made snacks as the two discovered their shared passion for improving the modern American food system (particularly issues around malnutrition, food insecurity, poor environmental practices and endless health problems). When they both found themselves eager for new work projects it was a clear choice to join forces and indulge their common interest: start producing a healthy, delicious snack using good ingredients and environmentally happy procedures. Henceforth, 2Armadillos was born. 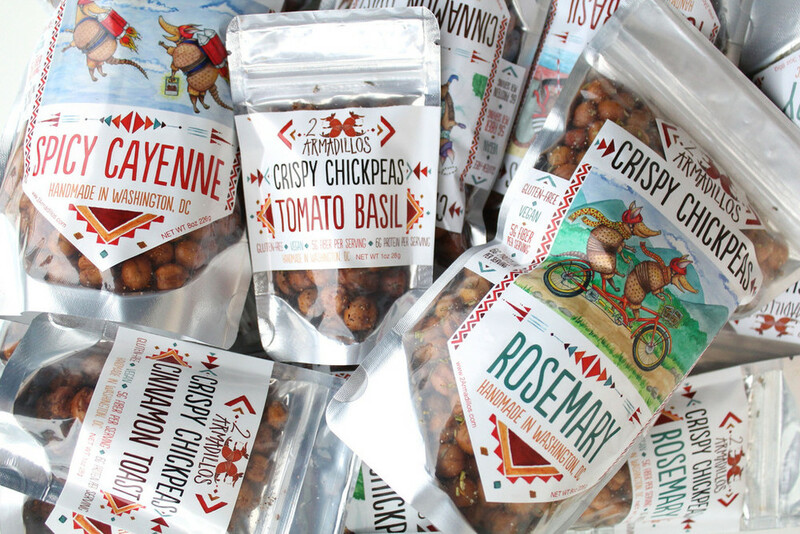 Since 2011, the company has grown in DC to produce several varieties of roasted chickpeas: Rosemary, Spicy Cayenne, Tomato Basil, and Cinnamon Toast. At Pleasant Pops, we’ve eagerly chosen to carry the first two, one a little sweet, one a little spicy, in 1 ounce, re-sealable bags. As a totally gluten-free and vegan snack, it’s amazing how addictive these crunchy chickpeas are. And seriously, have you heard of a cuter name for a snack company? (Not to mention the adorable back-to-back armadillo mascots). I’m pretty pumped to toss a few of these in my car soon, or as soon as I find a new road tripping buddy, and until then having them in my back pocket for a good long walk will do just fine.